Post your cold-water swimming experiences here. Water temp, duration, sensations, etc. This is my first winter season swimming at least once a week. Fortunately I live I live near the Great Salt Lake in Utah, USA so even though the water is icy cold, it doesn't freeze over due to the high salinity. So I don't need to deal with cutting through ice. A small group of 4 - 5 of us have really enjoyed it. It got down to just under 1c this winter, but it's up to 6c now and well on its way back up. Can only handle a few short minutes at those extreme temps and am looking forward to much longer swims at less extreme temps. Bloody Brilliant and a once-in-a-lifetime experience (for now)! Lelane (first female to swim across the Delaware Bay) and I did an official Ice Swim mid January off the coast of NJ. Water temps were 38, distance 1 mile, support from kayakers, Coast Guard rescue boat, media outlets, and friends. Entrance into water was quick, and getting the head and breathing down immediately was crucial. Warning, the hardest part is recovery...imagine a blackout from a college party without the ill effect of the hangover! Definitely not for the faint of heart but with proper training, definitely a worthy endeavor especially if you can join the ranks of the International Ice Swimming Association to boot! 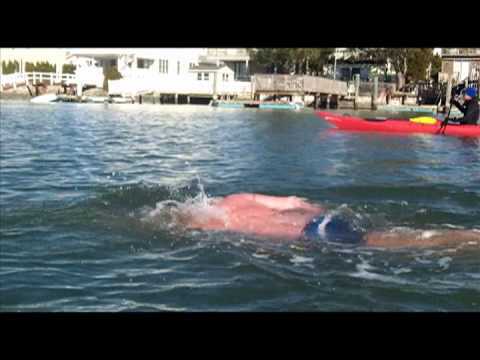 Here's the video of JC & Lelane's ice swim. Hope you don't mind, JC! @Gords I'm curious, does super-saline GSL water "feel" somewhat less cold than regular ocean water, similar to how ocean water feels somewhat less cold than freshwater? No worries, definitely don't mind! Since I'm on a bit of a YouTube-embedding frenzy, here's another great recent ice swim, starring Karen Rogers and Cathy Delneo in Lake Tahoe. Way to go, ladies! If Lewis Pugh or Lynne Cox sign up, they win this thread. When the local high school sectional meet was held at my local pool, they dropped the temperature to 80°. Even better was when the heater broke last year and the temperature "plummeted" to 74°. I had the whole pool to myself for 3 days, and shared it with a couple of hardy souls for an additional 2 days. Despite rumors, I had nothing to do with the failure of the pool heater. We've had a warm winter in the south Irish coast, temperatures didn't get below 6C, (42F). When did temps below 10C become "extreme cold" swimming by the way? I'm not interested in cold water swimming for cold water's sake, but I do need to get in open water asap to train for the Kingdom of VT 10 mile swim in early July. Was about to buy a wet suit that I don't intend to race in, just so I could start getting some longer outdoor swims in. I'm in the lower Hudson Valley in NY. Any thoughts on minimum water temperature for multiple miles? I swim at White Pond, if anyone knows it. I wonder If this could be amended to the temperature thread? How long? Wetsuit or mansuit? What's a wetsuit ? Wash your mouth out !! Tuesday 3 April North Sea Air 3° water 8.3° (47f) tough 35 mins today, took an age to get beyond the breakers and into the swell. MSW says 15ft swell tomoro... Should be fun !! Ok, mpfmark, my question is, why not a wetsuit? 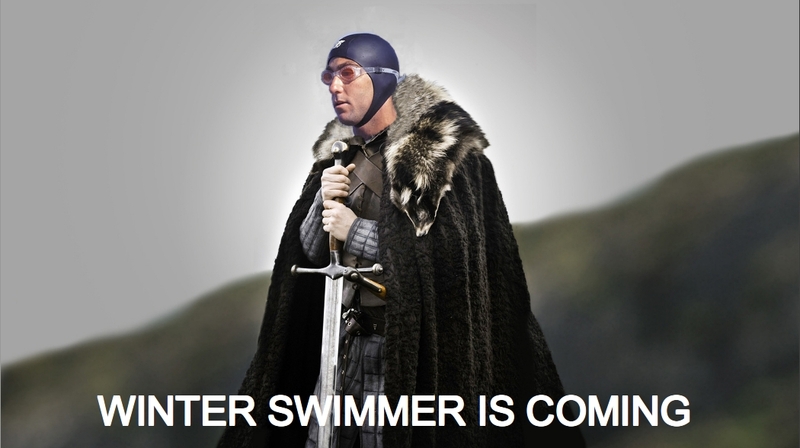 I have water in the low 50's here in NY, but I want to start training, outside, for a 10 mile swim in warmer water. Maybe not much warmer since it's a lake in VT and Quebec, early July. I wouldn't race in a wetsuit, but why not extend your training season in one? I've been vacillating on whether to buy one or not, but in the mean time, I haven't gotten an outdoor swim in yet. If the temp is going to prevent me from getting a longer training swim in, I might as well stay in the pool. My desire to go outside is so I can get a longer swim in. Not just see how cold I can bear. Really appreciate any thoughts on this. @GarbageBarge I would not expect the temp in Lake Memphremagog to be below 65 at that time of year. Even last year when the lake was churned up it was pretty reasonable. We had a very mild winter in VT, the snow has been gone for a few weeks. The lakes all iced off 3-4 weeks ahead of schedule, with no more snow melt to feed them they should warm up nicely by 7/7. I'd guess 68-75 by then. Good luck, enjoy your swim. Thanks for the knowledge @Birmingham. I was semi-kidding about a temp in the 50s in VT, in July, but if you're right, perfect. I'll sign up for 70 right now. I really am looking for some advice on whether to get a wetsuit and start outdoor traing now, or just get in and go for as much as I can take, and build the miles as the water warms up. Makes me a little nervous that I'd be in cold water alone, with no knowledge of how long I can go safely. @GarbageBarge Given the usual temps in VT that time of year I do not think that cold water acclimatization needs to be a major focus of your training. Getting in some rough water training should be though. When I have done Kingdom Swim I eased into the lake here in Central VT starting around Memorial Day. My advice would be to keep at it in the pool until your lake gets up to your "comfort" zone. When you take the fitness you have earned in the pool into the lake you will translate it into OW fitness quickly. I have not felt behind waiting until Memorial Day, I do my best training in the pool anyway. If your lake is already at 50 you won't have to wait that long even. VT lakes are still sub 40. One additional exception is if you have confidence issues in open water - in which case you probably shouldn't be attempting a marathon swim anyway. If you have previous experience in (and are comfortable in) open water, and cold water isn't an issue (and it probably won't be in the Kingdom Swim)... the only remaining issue is rough-water training. Will a few extra weeks in a wetsuit make a difference for you? I don't know... my guess is probably not. That said, if you really have the urge to get out in the OW, and a wetsuit helps you do so earlier in the year, then go for it! FWIW, the winter before my first long marathon swim (Tampa Bay) I trained exclusively in the pool. I lived in Chicago then, and the lake isn't a reasonable temp for long training swims until late May-ish. Wednesday 4 April River Tees England 44f just 25 minutes ! The reason I want to get in the pond is so I can get some distance in. I have access to a pool 3 days a week, but I can only get about a half hour, 2000-ish yards before work. So outside, after work or on weekends, is my only opportunity to get any kind of distance work. I'm not worried about getting used to the cold or rough water for VT. Only want to build stamina and shoulders for 10 miles at pace. I'd like to build to 7 miles by June so I'd like to get in now. If mpfmark can do an hour in 50°, I reckon I can too. We are in the river tomoro. It will be fresh so not the hour. I'll be in fresh water. 50° fresh is different than 50° salt? Fresh has the reputation of "feeling" about 3°F colder than salt. The mechanism for this is, as far as I know, unknown (but I haven't really looked). My intuition is that while fresh may "feel" colder than salt, the effect on core temp is equivalent. Almost ready to swim to the buoy in the Sea. So I finally got in the pond for about 40 minutes at 59° last week. No problems, but afterwards, when I stood up from bending down to get my car keys under the car, I nearly fell over. Is that common? Maybe the cold lowered my blood pressure? I didn't shiver, although my torso felt tingly after about 5 minutes out of the water. The temp can only go up now, if we could get some sun in the Hudson Valley. A scientific report of German Bruno Dobelmann (aka Orca) swimming 6h+ in 10C cold waters..."Changes in body core and body surface temperatures during prolonged swimming in water of 10 degrees C - a case report:"
Yesterday morning, I got in some 13C water, a new record for me. I was able to get in, but I only ended up swimming about 100m or so. I got in slowly, and took my time before I started to actually swim. My fingers and toes actually felt okay, but when I started to actually swim, my face just felt painfully cold. I stopped and started a few times, but couldn't get my face to not feel painful. How normal is this? If I had stuck it out for a couple more minutes, would it have gotten better? The last couple times I have gotten in open water, temperatures have been roughly 19 and 22, which I find cool, and can't just jump right into, but I find very comfortable to swim in. However, I think that part of the problem is that, for me, the jump between 19 and 13 was too much too quick. Is there any advice anyone can offer? Sounds normal after such a big drop, which we experience regularly in the lake here. It's why God invented backstroke. For that reason and no other. I bet you can go a lot further tomorrow. I think some people splash cold water on their faces before getting in but I've never bothered. I splash water, and regularly advise it as a valuable (and vital for beginners) safety measure. The Vagus nerve, which is, as I understand it, part of the cardio-respiratory control mechanism, is partly situated behind the sinuses, and therefore susceptible to cold. part of the this mechanism is the Mamallian diving reflex, which can be ovewhelmed by cold and cease to operate. By splashing the cold water you are about to enter on your face, and giving yourself a few seconds, you are helping to acclimatise the dive reflex and allowing it to recover, thus reducing the chance of aspirating water, which is one of the primary causes of death by cold shock. One trick is to pick a point that is ~7 minute swim away. Tell yourself that if you are still uncomfortable after reaching that point you are allowed to get out. Concentrate on swimming to that point, gradually increasing the amount of time your face is spending in the water (when it's really cold I'll do breaststroke, water polo freestyle, then one breath per cycle before finally adjusting to my regular breathing pattern of every 1.5 cycle). By the time you hit your target point you will be fine (in my experience). You will hyperventilate because of the vagus reflex, so keeping your face out of the water and not rushing to adopt your regular breathing pattern is important, especially when you are not used to the experience. Once you do that a couple of times you can generally get by on the memory of that acclimation process. i.e. it feels insanely cold now, but last week I did this and it was fine by the time I got to point A, so I'll stick it out. I've never done the splash the face trick, but the gradual facial immersion approach is not all that different. Mostly I’m alone in the water and now have a kayaker accompanying me in these cooler temps. The temps I’m in are probably laughable to you more experienced folks, but it’s all relative, I guess. I have no cold water goal at this time other than pushing my limits in regards to time in water and how cold I can tolerate. Here is my question: I self-assess with the pinky to fingertip test and stop occasionally to talk to my kayaker to make sure my brain is still communicating w/ my mouth. My friend is very experienced in kayaking but this is an entirely new game supporting a cold water swimmer. We’ve discussed signs of hypothermia, but what do I tell him to do if something should go wrong and we push it too far? We hug the shore so I guess I can exit the water if necessary, but my bag would be a hike away. Or would it be better to grab the back and have him paddle me to the exit point? I don’t plan to push it too fast too far, but nobody hops in planning to have an emergency. In hindsight, I feel stupid for not having a better plan. Any advice regarding safety is welcome. Swim shorter loops, have some one walk the shore line with dry towels and a blanket. Be careful of the "after drop". This is when you get out and start to warm up. The cold blood from your limbs goes back to the core and your internal temp drops. The cold water will hurt, but as long as you are moving it will take longer for hypothermia to set in. Don't be concerned about shivering, but be afraid if the shivering stops while you are still in the cold water. Just one additional tip - important to get covered up immediately after you get ou of the water unless you're fuly acclimated to low water temps. And dress from the head down - get your head covered with a wool cap first, then dry & cover your upper body, then your lower body. Then run some sprints up & down the beach. @JBirrrd, in practical terms a kayak is of very limited use to you if you are hypothermic. In your circumstance outlined above, you may not be able to hold on as they paddle. What do you do then? Also, if you're holding on, you're not swimming and are losing what precious little heat you have left even faster. It is good to have someone there who can tell you to get out, but in reality you need to be able to get out under your own steam. It's not fair on a kayaker to put them in the situation where they can't rescue you. Can you exit anywhere on the shore? If so, why not bring all your gear on the kayak in a dry bag? Then you can exit quickly and have all your dry clothes at hand? As you build up experience, you will know how your body reacts to falling temps. It may be the pinkie extending, "the claw", leg cramps, head ache, purple back etc. Don't base your swim distance/time on water temp alone. I always use a combined airtemp and water temp. 10 deg water and 10 deg air is a lot easier than 10 deg water and -5 air. Also sunshine makes a huge difference. If you swim to your limit one day and it's say 30 mins with the sun on your back, and the next day you turn up and it's cloudy and foggy, then it's unlikely you'll make 30 mins again. So pay heed to the signs. Write down the temps and times etc. If you're extending the times, do it in small steps. Swim regularly to keep / build acclimatisation. Stay safe. Thank you all so much. I do have my post swim routine down pat: Parka & hat on, peel off suit, throw on uggs and help carry kayak back up the hill. That fast and furious activity keeps me moving and and I guess is equivalent to sprinting/exercise. Generally I don't start shaking until I'm settled into my car and trying to drink hot tea. The suggestion to do shorter loops totally makes sense, but here's my problem w/ that. I lose my resolve and motivation when I get near my exit point and if I am anywhere near 30 mins, I think, well that's good enough and get out, even though I know I can go longer. Happens pretty much every time. I am weak. I want to be able to push it as far as possible on the front half, turn around and finish with only fumes in my tank. But so hard to know what my limit is b/c I always feel that nice warm core feeling on the first half. Pretty sure, if necessary, I can exit at any one of the docks along the shoreline and take the foot path back to my parka & bag. I like the dry-bag idea. Will throw an emergency towel, hat and flip-flops in a bag and keep in boat. I do understand water temp is not the only consideration and I am keeping track of everything. I once got pulled from a race for hypothermia. No indiv. kayak support. Scary, I got lucky. Don't want that to ever happen again. The kayaker thing was my biggest concern and you've confirmed what already I knew. He can't really do anything to rescue me, only monitor my condition. I just need to be smart and take it slowly. I hear you. Definitely, want to do this safely. Don't be concerned about shivering, but be afraid if the shivering stops while you are still in the cold water. I thought shivering in the water was a bad sign and to get out immediately. Can't remember where I saw that. I have never started the shivers in water, just a little teeth chattering, but then I know it's time to get out. So in water shivering is ok? Shivers followed by no shivering, bad? @ColmBreathnach What is this purple back you mentioned? Never heard of that. And I get my giggles from recording selfie videos shivering in the car. Cracks me up. I'll try to do a tongue twister next time.